So every week, Amy @ Hope is in the Word (http://hopeistheword.wordpress.com/ - for some reason my linky thing isn't working here, of course) hosts a Read Aloud Carnival in which she invites you to share books that you've been reading aloud with your kiddoes. If you scroll down on my sidebar, you'll find the Read Aloud Thursday topic and you can view all of my posts under that subject. (You can visit Amy directly and do the same thing.) It's been fun to share books that we've picked out and have been reading together, just Mommy & Bookworm1. 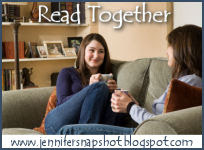 THIS month, Jennifer @ Snapshot (http://jennifersnapshot.blogspot.com/) is hosting a Read Together challenge. Since I read aloud to my son all the time I didn't feel like it would be much of a stretch for me to join the challenge - although I really wanted to (because I like Jennifer and I like challenges and the two combined seemed like a good enough idea to me). However, I reread her introduction post giving instructions about it and one of the things that Jennifer suggests is that you find a way to stretch yourself. Ok. Hmm. Think, think, think (in Pooh Bear fashion)! And then it came to me. My little bookworm, being 2 and having the attention span of a 2 year old, has been asking me about books on our bookshelf such as Katy No-Pocket and I keep saying that those books are for when he's older and back on the shelf they go. Too many words and not enough sit capacity. (I am bothered when he runs out of the room mid-book or jumps off the couch mid-sentence, I admit it!) Then I thought that the purpose of read alouds is really for them to learn to listen and not so much for them to look at the picture. As an experiment I picked up the book Wait Till the Moon Is Full (pictures by Garth Williams of Little House fame) and started reading it to him because he asked me to. Yes, he walked away. I kept reading (I had to force myself to.) and he wandered around the room as I read. Every other page or so he'd come bopping back over to check out the illustrations, listen to a few words and then continue on his merry way. He DID end up hearing the majority of the story and as he played he'd occasionally repeat out in a sing-song voice whatever words I had just finished reading. "Wait! Till! The! MOON! Is! FULL!" A light bulb went off in my head. Now maybe this is an obvious to some of you but I hadn't really thought of reading beyond his reading level. Not at 2 1/2. Maybe, just maybe, it's always ok though. He's gotten in the habit of asking to hear stories that I either make up or follow the story line of something he is familiar with. So during the month of April we're going to read above our attention span level. I'm going to actually READ ALOUD while he does whatever it is he is doing. Maybe he'll hear the story and maybe he won't quite grasp it. So long as he keeps coming to peek over my shoulder periodically, we'll give it a shot and see what happens at the end of the month. Wait Till the Moon Is Full , by Margaret Wise Brown. (She also wrote Goodnight Moon and The Runaway Bunny.) The illustrations in this book are by Garth Williams and are in black & white, with brown highlights here and there, until the very last page which is in full color. It is the story of a young raccoon who has seen the daytime and spends the book begging his mommy to be able to see what the outside is like at night. Mommy raccoon spends the book telling him that he will need to wait until the moon is absolutely full - not a sliver, but full, bright and beautiful. It's a very cute book that I had never heard of before until just recently. Likewise, we picked up the book Choo Choo , by Virginia Lee Burton at our local used bookstore. You may have heard of Mike Mulligan and His Steam Shovel? That's another book by Burton. Choo Choo allows us to keep up with our train obsession while still broadening our horizons a bit. Burton wrote this story for her little boy, Aristides, when he was four years old and no doubt as in love with trains as my son. The illustrations in this book are also in black & white and this tells the story of a train who decides to run away and discovers what a mess one can get into when they are off doing their own thing. Lastly, I've pulled Katy No-Pocket off the shelf. This is another children's classic that you are no doubt familiar with. I think Bookworm1 is intrigued by it because the kangaroo is reminiscent of the one in Horton (whom we love). The first read through of this book involved my shortening the story to match his attention span (because he was insisting the book be read) but our next go around will be in full. To read further and farther than we've ever read before - beyond our attention spans and comfort zones to broaden our horizons. We'll just see where this takes us and go from there! Happy Reading Aloud Challenges to all of you! Oh, I'm so glad you're doing this, Carrie! I started reading Little House in the Big Woods aloud when Lulu was 3, I think (so Louise would've been not even 2 yet probably). I abandoned that effort, but it wasn't too long after that (like maybe when Lulu was barely 4) that we began reading chapter books in earnest. I'm a big believer in reading "over children's heads." They get way more than we think they do, even when they're up running around. Kudos to you! I've never seen that Margaret Wise Brown book. I think I got another when this week at the library by her that I'd never seen before. I'll have to look for the one you highlighted. She must've been more prolific than I knew. As always, thanks so much for playing! Those are all excellent choices, and I want to encourage you: young children can listen while they are engaged in something else. I know it's crazy, because you wouldn't think they're listening. But they ARE! Totally true. D2 comprehends at a much higher level than D1 did at his age, mostly because he's always listened to *her* books. And as we've gone on I've been more willing to experiment a little. They may not understand everything about a book, but if it crops up in their play and they keep asking for it, I know to keep going. Goodnight Moon & Mike Mulligan are two of our favorites right now - I'll have to check out these books now, too! Thanks for sharing! Good idea! I started reading beyond their level (longer stories) around age 3 or so I think -- so yes. And I think that it's a stretch to just read while he walks around. That used to drive me NUTS with Kyle until I learned that he is listening (okay--maybe it still drives me nuts). It drives me nuts when the kids are up and wandering around when I'm reading, too. I have been reading chapter books to KidA (4), and KidB (2 1/2) wanders over to look at the pictures and listen to the books. I started out with easy books like Mr. Popper's Penguins and My Father's Dragon (KidA's personal favorite right now). Isn't it so true that there is always a way to stretch ourselves beyond where we are? I love that you are willing to read ahead of where he is even though he's not totally engaged; it's sort of like playing classical music for children. They may not get it all right now, but it builds the foundation and the familiarity for later on.